Tell people you’re going to Albania for a holiday and they’ll look confused and probably ask you why. Tell them you’re going to the Albanian Riviera and they’ll start to look a little more interested (turns out adding the word ‘Riviera’ onto anything can make people perk up). But the fact remains, Albania isn’t considered a top tourist destination by…well... anybody really. But those people are missing out, because there are plenty of reasons to visit the Albanian Riviera – its stunning beaches (that aren’t jam packed with other tourists), its world heritage sites, its weather, its food and of course the price – its extremely cheap (think Greece or Croatia without the price tag). While I was in Albania I’ve never had so many people contact me on social media (friends and strangers alike) to ask what I thought, if I’d recommend it and if it was safe. The answers are that I loved it and I’d definitely recommend it. The contrasting combination of beautiful beaches, breathtaking UNESCO world heritage sites, quirky cities and friendly locals make Albania a hidden treasure well worth discovering. And if you’re worried about safety – don’t be! The Albanian Riviera is very safe, it's full of local families having fun; in fact, I felt safer than I have in plenty of other European locations. So throwaway any preconceived notions you have of this country and keep reading to find out how to get there, where to stay, what to do, tips for while you’re there and even a few fun facts about Albania. I usually go to pretty accessible places in Europe so I don’t bother writing about how to get there. But I didn't really know how to get to the Albanian Riviera. I didn’t want to fly into the capital Tirana, as the drive is more than five hours down to the Riviera. Luckily there is a much easier way to get there – catch a flight to the Greek island of Corfu and then take the cheap and quick (30 minute) ferry across to the Riviera’s unofficial capital and launching point Saranda. Sorted. If you do an image search of the ‘Albanian Riviera’ the majority of images that come up are of Ksamil (which is pronounced as ‘Xamil’ by the way). Why? Because it's picture perfect. And a great place to base yourself in Albania if you want to spend most of your time lounging on the beach and eating (that's what holidays are for right?). Ksamil is a 12km drive down south from Saranda, and very simple to get to by cab or bus (which will set you back cents rather than dollars). When we got off the ferry from Corfu we caught a cab to Ksamil (they'll be waiting out the front of the terminal), and came back by bus. Ksamil’s beaches reminded me of Greece’s. The majority of them are privately owned and back onto restaurants and cafes that supply beach lounges and umbrellas that cost a couple of euros for the day (if you come after 3pm it’s cheaper). Make sure you get there early in summer, as the spots go quickly (and the best ones appear to be cheekily reserved for the locals). Once you’re settled in you can swim in the calm azure water or lay around reading and eating the donuts, fresh fruit and other sweet treats that locals wander around selling. While I had a very lazy trip and didn't participate – there are also plenty of speedboat rides and other fun activities waiting for the more thrill-seeking tourists. So you're set. If you don’t know much about Albanian food, it’s quite like Greek food – aka it’s delicious. My favourite restaurant in Ksamil was Beach Bar Restaurant Korali. It’s on the water, with an open balcony, so you can watch the sunset from your table (and by the way the sunsets here are phenomenal). The seafood (especially the fresh grilled prawns which were equivalent to less than £8/$11USD) and mousakka were my favourites and the cheesecake was so good I had one everyday I was in Ksamil (I was on holiday after all). While you won’t see it on the menu, they serve carafes of local wine at about £3/$4USD a pop. So you’ll eat and drink like a queen, with a stunning view, at pauper’s prices. What’s not to love about that? 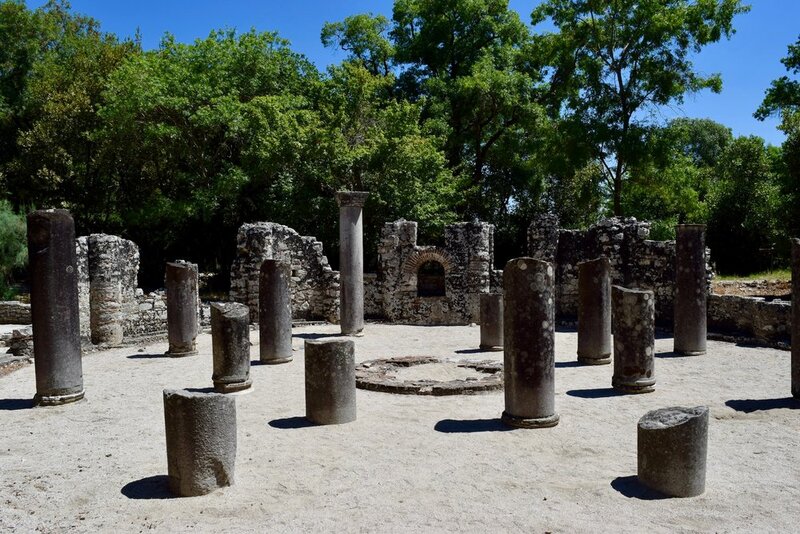 Butrint is Albania’s crowning jewel. This prehistoric UNESCO site was one of the highlights of the trip for me. Butrint was an Ancient Greek and later Roman city with evidence of habitation as far back as the 12th century BC. Its ruins, which remain extremely well intact today, are spread over a large area of a wider national park. It takes a good three hours to explore them properly. You’ll see what remains of a 3rd-century-BC Greek theatre, Roman baths, and 6th-century paleo-Christian baptistery decorated with colourful mosaics (which sadly are mainly covered by sand to protect them) among other things. I’m not sure I can do justice when describing Butrint, it’s one of those places you just have to see for yourself. Because it’s so well preserved, it allows you to think a lot about what life must have been like thousands of years ago and it’s hard not to get a bit of perspective from that. Getting to Butrint from Saranda or Ksamil is pretty easy. Obviously if you have a car you can drive but there are also local buses that go once every hour from Saranda to Butrint via Ksamil (and vice versa). The timetables are at the bus stop. We caught the bus back from Butrint to Ksamil. It took about 20 minutes and cost the equivalent to about 70p/85 cents per person with tickets we bought onboard. On the way we walked to Butrint, which took about an hour from Ksamil. I’d read quite a few people saying the walk from Ksamil is a lovely jaunt through the olive groves and I’m sure it is…if you know how to find the path to get there. We ended up walking along the main road like idiots for an hour, which wasn’t much fun as there was no footpath – so if any of my Albanian friends can shed some light on how to walk to Butrint from Ksamil without doing it on a main road please let me know so I can add to this article! Tip: Make sure you pack a lunch and bottled water, particularly in summer, as there are no food shops or cafes at Butrint. However there is a pub next door to the entrance where we grabbed a drink while waiting for the bus to arrive to take us back to Ksamil. 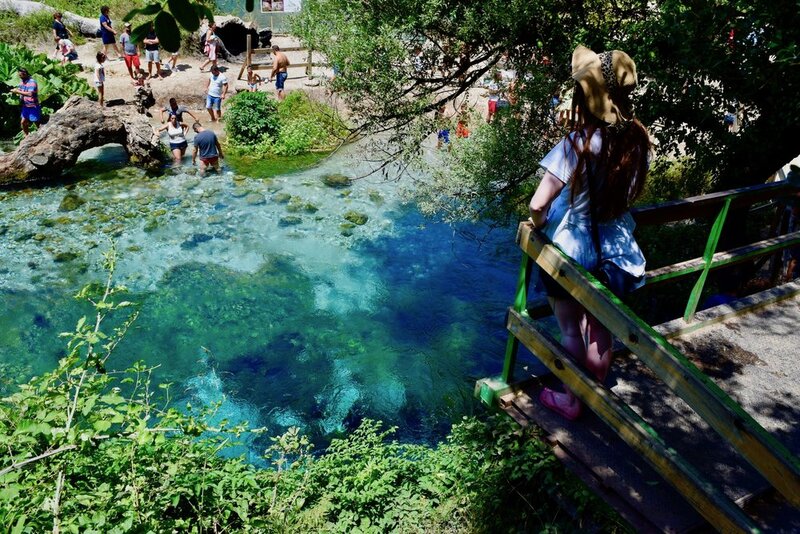 The Blue Eye (or Syri I Kalter as it’s known to the locals) is a breathtakingly beautiful fresh water spring, located about 20kms from Saranda. It’s a little bit of a trek to get there – but it’s worth it to see the crystal clear water bubble up from a sparkling, aquamarine hole that’s at least 50 metres deep. The spring is classed as a natural phenomenon because nobody really knows what it is or how it formed (although there are plenty of local myths). We visited in July when it was 36 degrees (so quite warm, even for an Australian!) but it was like a calm and cool oasis. 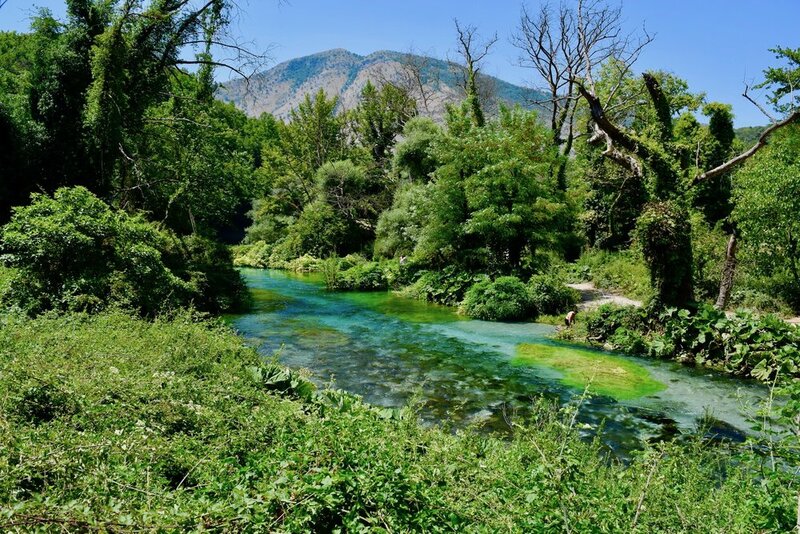 Once you see the blue water, turning slowly lighter as it heads downstream contrasting with the surrounding green trees and vines, you’ll feel a world away from the more hectic vibe of other tourist destinations in Albania. And I promise it is as stunning in real life as it is in the photos. If you’re feeling brave, bring your bathers and join the many other flouting the ‘don’t dive’ rules. But be warned the water is absolutely freezing, so I personally saved my swimming for the nearby beaches where the water wasn’t quite as frosty! Car: those brave enough can hire a car and drive themselves. The benefit of this is that you can also visit the UNESCO listed town of Gjirokastra in the same day, which we didn’t get a chance to visit. Bus: we looked into taking the bus but decided against it. I try to avoid hassle when I’m on holiday and the bus that goes closest to the Blue Eye drops you off 2kms away from the spring and runs irregularly. There are plenty of people online who say they’ve taken the bus and had no issues, but that particular day I didn’t feel like getting stranded in 36-degree weather waiting hours for a bus. Cab: lots of people take a cab to the Blue Eye. It costs approximately about 30 euro and the driver will wait around while you explore so it’s a pretty safe option in terms of ease and reliability. 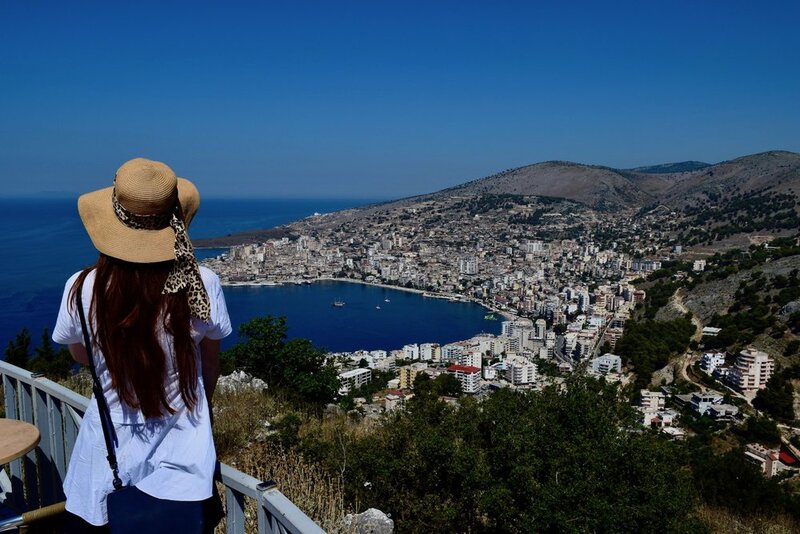 Tour: In the end we decided to do a private day tour with Sipa Tours (we didn’t know it was private until we arrived and were the only ones on it) from Saranda, which included a visit to the city’s Lëkurësi Castle where you get great views. This cost 35 euros per person so it was quite pricey for Albania, but pretty cheap for a private tour in most parts of Europe. Having a tour guide also meant we got a great understanding of Albanian culture, the country’s interesting history and the current political climate. So if you’re happy to spend more, want to learn something and have a hassle free trip to the Blue Eye, this is a good option. Saranda is the biggest town in the Albanian Riviera. It’s grungier and more lived in than Ksamil and the rest of the surrounding area and if I’m completely honest, it was my least favourite town in the Riviera. 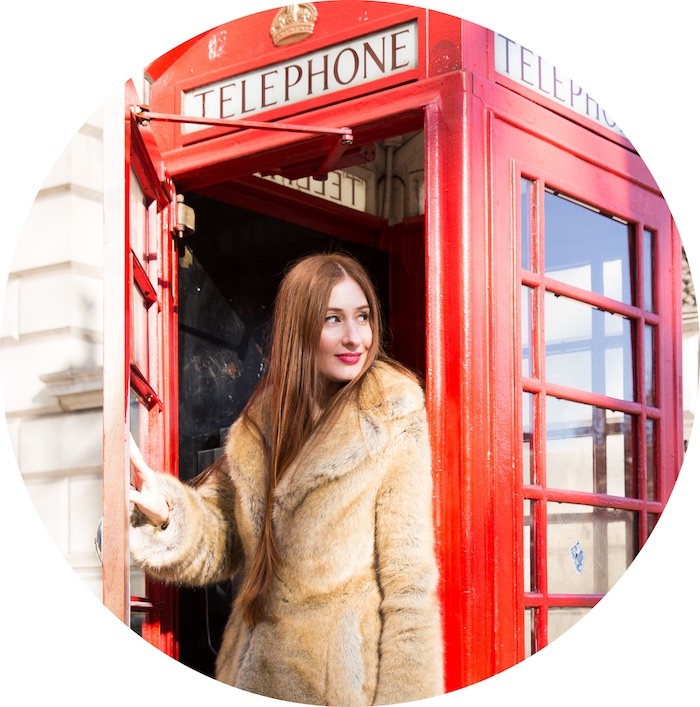 Not because it isn’t nice – it is – but I just thought it lacked a little bit of the charm and the chilled vibe of the stunning surrounding towns and sites. That said, the city gives you a good feel for what day-to-day life is like in Albania. In my experience, Albanians are family-oriented, social and love to have fun. At night, Saranda’s promenade is packed with families and friends wandering around eating, drinking coffees and having a fun time. If you’re there in warmer weather, when food and market stalls line the walkways, I’d recommended trying some snacks from Beer and Fries Forever where they hand cut the fries on site and serve them with a massive range of delicious sauces. Yum. Cash only: like in many of the surrounding countries, cash it still king in Albania. In Ksamil especially we couldn’t use card anywhere – even at our hotel. So make sure you get some out soon after arirving (the local currency is lek). Smartphone data: If you're guilty of having a smartphone addiction like me, you might want to consider getting a local simcard. While I can use my UK data in the EU at no extra charge, my phone company was charging £5 per megabyte in Albania. No thank you. I grabbed a local simcard for £6, which gave me more than enough data for my weeklong stay. English: Okay, I don’t like writing this because I hate how lazy English speakers (me included!) kind of just expect the world to speak our language. But a lot of people have asked me how I found the level of English in Albania. Nearly everybody we interacted with had reasonable, if not good English – so no need to worry about that. The name of Albania in the country’s mother tongue is Shqipëria (it’s easier to pronounce than it looks as the ‘q’ is silent). Albania doesn’t yet have McDonalds (!) or Starbucks. Albania was the only European country that managed to liberate itself without the intervention of foreign troops in World War II. Albania is also the only European country to increase its Jewish population during World War II from 200 to 2000 thanks to it becoming a safe haven for those fleeing persecution from other European countries. The country was largely closed off from the rest of the world from the 1960s to the early 1990s under the communist rule of dictator Enver Hoxha. Albania is home to more than 700,000 concrete bunkers, constructed in case of invasion during its communist years by Hoxha. You can still spot them today as you travel around the country. Many Albanians lost their life savings in the 1990s after investing in Ponzi pyramid banking schemes, which were widely supported by the government. Albania applied for European Union (EU) membership in 2009 and became an official candidate for accession to the EU in June 2014. But so far the country has been rejected twice for full membership. There are apparently more Albanians living outside the country than its internal population of about 3 million. Despite being born in what is now the capital of Macedonia, Skopje, the most famous Albanian and the country’s first Nobel Peace Prize winner is Mother Teresa. Albania is a stunning and relatively untouched country in terms of tourism. If you’re sick of battling crowds in typical summer holiday destinations like Spain and Greece, I’d highly recommend visiting the Albanian Riviera. Albanians are aware that their country sometimes gets a bad wrap, so the already warm and welcoming locals work extra hard to show you how wrong that reputation is. Tourism will take off at some stage in this amazing country, it's a matter of if not when. So go now before fighting other tourists for a spot on the beach becomes the norm.